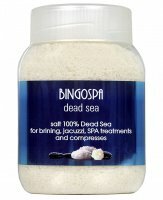 Sulphate and magnesium salt by BINGOSPA. Created especially for mineral baths, SPA treatments and home-made wraps. 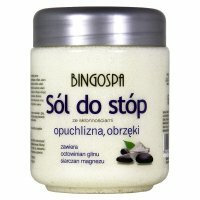 It contains extracts of aloe, flax, chamomile, sage and eucalyptus oil, which relax and cherish. 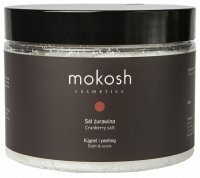 It has a light formula suitable for all skin types, which after mixing with water turns into a delicate, aromatic foam. The product is available with a capacity of 1250g, making it sufficient for a long time. It has many beneficial substances. It allows you to perform professional SPA treatments at home. 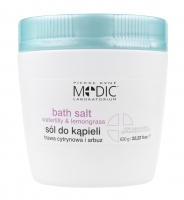 For mineral baths: Add 3 flat salt capsules to water at 37-40 ° C. Plunge into 15-30 minutes. Then, without rinsing, dry the body with a towel. It is recommended to take 2 baths a week. 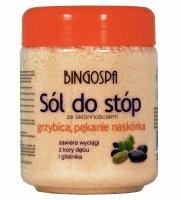 For SPA treatments: Add 1 flat salt nut to water at 37-40 ° C. Bathe for 15-30 minutes. Then, without rinsing, dry the body with a towel. It is recommended to take one bath a week. For compresses: Half-fill the salt cap with water and mix. Apply the solution to selected parts of the body. After 10-15 minutes, rinse the body.